There are big savings to be had on this classic notebook brand. Black Friday is upon us and there are plenty of deals going live over the Black Friday and Cyber Monday 2018 weekend. A lot of these deals are on high-value items such as laptops, monitors or cameras, but what if you're after something smaller? If – like us – you have a penchant for notebooks and stationery, even if you don't necessarily use them as much as you used to, then you're in luck. 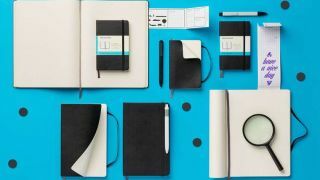 Moleskine is having a Black Friday sale, and they're offering 20% off in the UK, and 25% off in the US. The US offer is site-wide, so there's a huge selection of products to choose from, while the UK site is limited to a selection of products. To save you trawling the whole site, we've picked our best deals below (jump to US deals here).